It’s ironically fitting that early Christians were called atheists and modern atheists can only exist within a Christian context. “An atheist,” John Gray writes in his new book Seven Types of Atheism, is “anyone with no use for the idea of a divine mind that has fashioned the world.” That is, atheism is not a rejection of religion, but the absence of a creator-god. In this sense, according to Gray, “atheism does not amount to very much.” This is because monotheism and what we think of as atheism are actually sides of the same coin—a true atheist gets rid of the coin altogether. Gray is the author of many unsettling books expounding his post-humanist philosophy, such as Straw Dogs, The Silence of Animals, and The Soul of the Marionette. Each of these works is a revelation—they should be read by anyone who wants to understand contexts of contemporary thought. 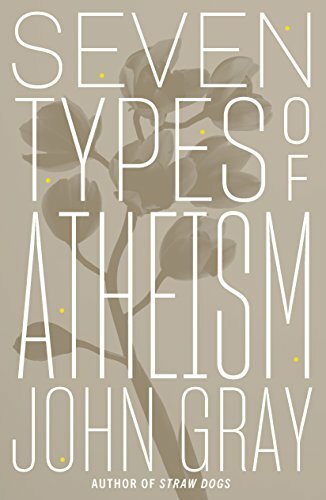 Rather than offer something new, however, Seven Types of Atheism is more a compendium of Gray’s previous ideas, reframed within the context of various atheisms. Pointing out that progress is a myth, that secular movements of humanism are continuations of the Judeo-Christian worldview, and that the gnostic belief of deliverance from a dark world through the saving light of knowledge lies behind revolutionary modern political religion—Gray’s major themes are recycled here, each given a chapter rather than its own book. Gray lights up when he reveals commonly held notions to be illusions, subverting what we thought we knew about the world. What he really likes to do is stand up someone’s idea and then pull the rug out from under it. In Seven Types of Atheism he demonstrates that our cherished Enlightenment thinkers—Hume, Kant, Voltaire—were shameless racists and colonial apologists, despite being held as bastions of reason and tolerance. Gray seems to think this discredits their idea of a rational morality. But it’s like pointing out that the authors of the Declaration of Independence were slaveholders. Yes, and? Nobody’s perfect, but that doesn’t mean flawed beings can’t express ideals worth striving toward. The other thing Gray does best is write with a devastating, aphoristic style. Our Post-Truth era isn’t a surprise when one understands that “the human mind is programmed for survival, not truth.” “Partisans of revolution,” Gray writes, “reform and counter-reform think they have left religion behind, when all they have done is renew it in shapes they fail to recognize.” That could be the book’s theme. The idea of humanity being a myth may be its motif: “‘Humanity’ is not going to turn itself into God, because ‘humanity’ does not exist. All that can be observed is the multifarious human animal, with its intractable enmities and divisions.” Yet perhaps the line that most encapsulates Gray’s point is: “Belief and unbelief are poses the mind adopts in the face of an unimaginable reality.” There are countless examples of such literary knock-out punches. Yet Gray has holes in his own underwear, as it were. For one thing, as he indicates, the very category of atheism is substanceless; the term atheism—like the terms pagan, gnostic, and Hinayana—was created as a polemic, an artificial category defined by its enemy, and therefore doesn’t really exist. One might be attaching too much importance to the title (which is a nod to William Empson’s Seven Types of Ambiguity) but for someone so deeply knowledgeable, it seems misconceived to devote a book to a subject that dissolves upon closer scrutiny. Or at least it feels like there’s a lack of coherence between the book’s premise and its content. But there’s a deeper problem with Gray’s approach to these questions. He critiques Spinoza’s belief that the universe itself is God—infinite and eternal, and therefore without a duality of mind and matter—because Spinoza cannot verify such a belief by experience, and thus can’t know it to be true. Spinoza, he says, could only rely on pure reason. Yet Gray himself always relies on reason as the chopping block of belief, rather than experience. For instance, in the introduction he mentions Buddhism and Taoism as types of atheism, but then leaves them out of the rest of the book. He writes “Schopenhauer believed that since life is full of pain and sorrow the best course was detachment,” and that “by separating oneself from the human world and refusing any close personal bonds, the suffering of life could be kept at bay” without noting that Schopenhauer lifted this from Buddhism, and that these conclusions are verifiable only through following the Buddha’s teachings, not by reading about them. Time and again, Gray asserts there cannot be universal laws or a universal morality without a divine law-giver. He’s brilliant when he writes, “The order that appears to prevail in our corner of the universe may be local and ephemeral, emerging randomly and then melting away,” but he’s off when he continues, “The very idea that we live in a law-governed cosmos may be not much more than a fading legacy of faith in a divine law-giver.” The Buddhist path is one on which a practitioner discovers, through experience, that there is a universal law of morality. The proof is in the practice. The reason to be moral is because morality creates a peaceful life that is good for oneself and good for others—and that’s the only reason one needs. That is to say, like much of the philosophies he criticizes, Gray’s ideas are limited within a Western context, and thus preclude the possibility of accepting answers he too easily dismisses. Even so, to read Seven Types of Atheism is to wrestle with what it means to be alive. It’s true we are deluded human animals, living in a universe devoid of meaning and value—but the wrestling itself creates the experience of meaning, and makes such a life worth living. Randy Rosenthal's work has appeared in The Washington Post, The Los Angeles Review of Books, Harvard Divinity Bulletin, and many other publications. He is a recent graduate of Harvard Divinity School, edits, and teaches writing at Harvard.